The showdown between Gov. 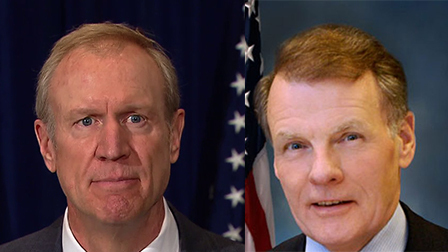 Bruce Rauner and House Speaker Michael Madigan continues as state lawmakers stare down a May 31 deadline to approve a budget plan. On Wednesday, lawmakers will continue to vote on a series of measures that make up the spending plan, backed by Madigan, that’s about $3 billion short. At the same time, lawmakers will hold hearings on items that make up Rauner’s Turnaround Illinois agenda. Senate committees are slated to hear testimony from the Rauner administration on proposed changes to worker’s compensation and lawsuits as well as a property tax freeze. Rauner has said he wants these changes as lawmakers negotiate on how to close a $6 billion budget shortfall. But Madigan on Monday said Democrats would move forward with their own spending plan and criticized Rauner for putting “non-budget issues” in the budget process. In a statement Wednesday, Rauner spokesman Lance Trover accused Democrats of pushing a spending plan that would rely on tax hikes in order to be balanced.